The OFL 200 OTDR sets new standards for size, weight, ease-of-use, and value in a telco/broadband OTDR. 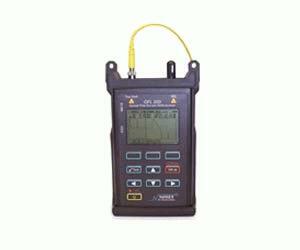 Smaller than many optical loss test sets, the OFL 200 has the range, features, and price to make it the perfect OTDR for outside plant crews installing and maintaining optical fiber cables in broadband, metro, access, and FTTH networks. Unlike optical fault locators , which detect only reflective events, the OFL 200 is a true OTDR, which detects fiber backscatter as well as fresnel reflections. Thus, the OFL 200 can locate reflective and non-reflective breaks, including those caused by crushed fibers. In addition, the OFL 200 provides an integrated 650 nm visual fault locator (VFL) for shortdistance troubleshooting and fiber tracing. The fast change switchable adapter allows the OTDR to interface launch cables with a variety of connector styles. The OFL 200 can internally store up to 48 traces. Using the supplied serial cable, saved traces can be transferred to a PC for archiving, printing, and analyzing with the supplied Trace600 Windows? software. Test results are stored in Bellcore [*.sor] GR-196 Version 1.1 format.